Inspired by the bright, fresh colours appearing in my garden, mainly a pretty golden yellow on my kerria shrub, I decided to make a masterboard ready for Easter cards. I only ever make three for in-laws as my family have never been 'into' cards at Easter - eggs are a totally different thing altogether though. 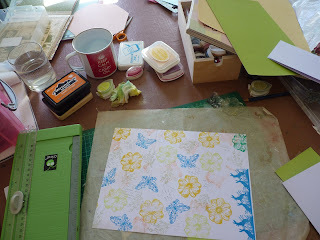 Lots of spring colours and some free stamps from Craft Stamper plus a few fillers. Bunnies at the bottom and the green flower were just a try-out and were cut off later. 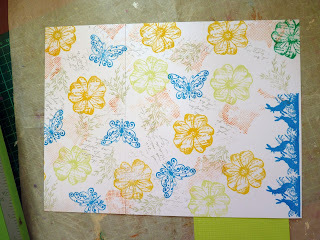 Here's a closer look and the cards I made - I love lime green. Keeping it short and sweet this week as I know how long it takes me to get round as many other desks as I possibly can. Pop on over to Julia's Stamping Ground for a nosy at more desks. What gorgeous cards Ann, you do cards so well. Cannot believe this weather - need to be out enjoying it whilst it lasts. Over Easter??? Hope Sorrel is enjoying the warmth and not getting too hot. These are lovely cards, Ann. I am a big lime green fan, too. It goes with practically everything. 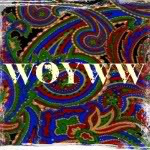 Happy WOYWW from #3. Hi Ann. 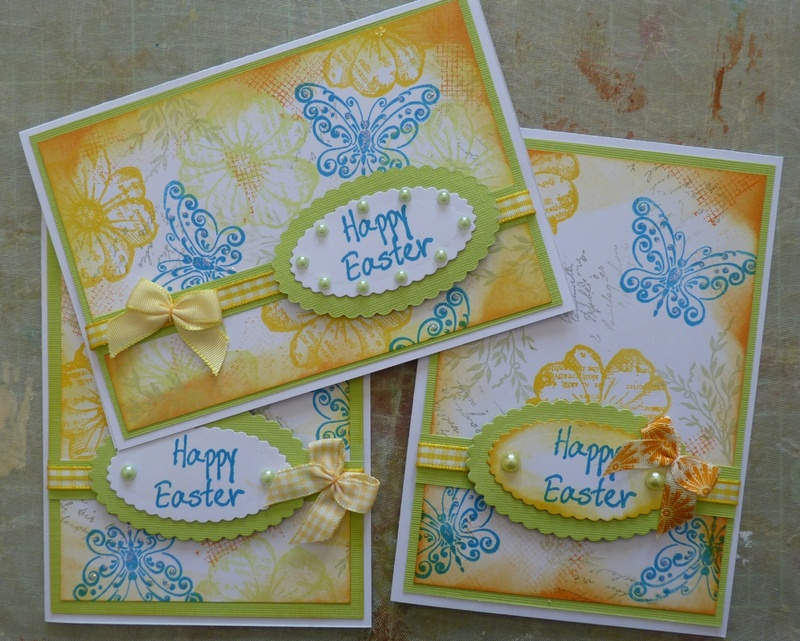 Beautiful Easter cards. The design you have created is lovely. Simple but so effective cards, love them. 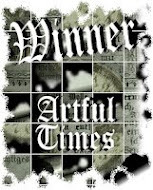 I'm between visitations by the grandees... awaiting the next lots so I was able to post. I'm worried now that the next lots won't get here due to the petrol strike and I've really been looking forward to it. These are pretty cards Ann.Easter..yipes so near ! !Where is the year going?!!! Oh, I do love your Easter cards. 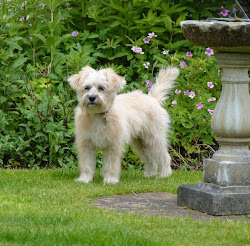 Your garden must look lovely!!! Lovely Spring colours Ann and they've made great cards. Any more cheek from you though and I'll be straight over to nick my sunshine back! They did a guided busway thing in Cambridge last year, it goes right behind my MIL's house in an old railway cutting. Not sure how well it's used as it had not long been open when we were last there, but it was incredibly quiet, and they did a really good job of the installation and the maintenance work behind the houses (fences and planting etc). I love how you made the masterboard! lovely cards, gorgeous colours. I dont make easter cards either, much more into the chocolate!! the flower stamp is one of my fav free stamps too. Your cards are gorgeous, the colours are beautiful. I noticed your cutter, it is the same as mine, which is evil and won't work properly. Do you have trouble with yours? I finally figured out why I am always in the hundreds!! Time change, you know! Your background works so well on your cards ...love them. I have just bought 3 Easter cards but never thought to make my own! I know I'm a numpty and been living in a cave for the last 12 years so maybe by next year I'll be able to show mine. They'll not compare with your's though...they are beautiful. Beautiful cards you have made! The colours are so Spring-y! They will be well received I am sure! Good Morning! Still trying to make all the rounds to the desks. What a great idea to do the masterboard and those cards are so cute! I haven't done the masterboard in a long time thanks for the reminder. 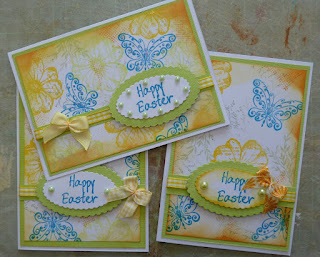 Beautiful stamping -- gorgeous cards! I, too, am confused about the master board -- is it like a sample, to try out the inks and stamps and decide what you like? Happy Thursday from #151. 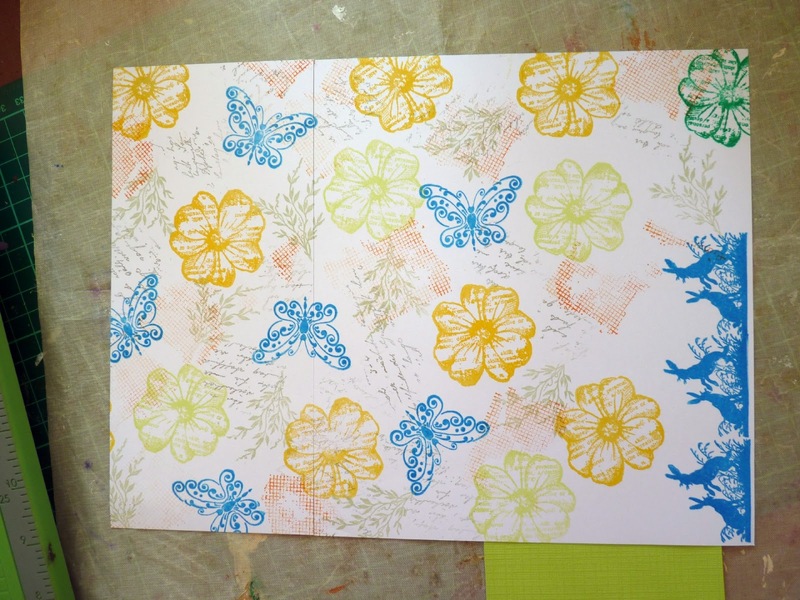 Great cards, it's fab how just one bit of stamped paper can become so much more! Sorry i'm late, you know how it is!! I love all the colors you used! They are so perfect for Easter!